Geek Couples: Jamie and Victoria | Warped Factor - Words in the Key of Geek. Christopher Morley finds an undercurrent of love between two of the Second Doctor's finest companions. We might nowadays think that romance, or at least its implication, is second nature to Doctor Who. Witness the oh so subtle hints that there could have been something more between Rose Tyler and the Ninth, who in the very act of kissing her sacrificed himself, and Tenth Doctors, and Amy Pond's own near fatal attraction to her beloved raggedy man. And of course there's the retrospectively unshakable - given his initial insecurities over her travelling in time with the madman in the box and her barely disguised hots for the Doctor - love between Pond & her Rory, thrown together as companions to the chap in the bow tie circa Vampires Of Venice. 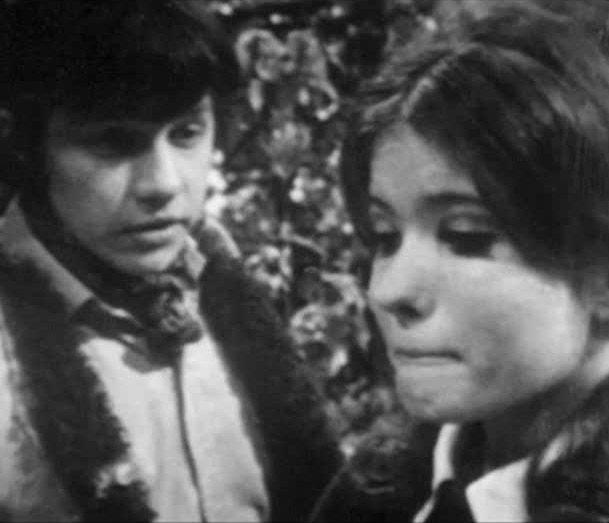 But, arguably even more radically given the times, might we be able to read a subtle undercurrent of unspoken love between two of the Second Doctor's travelling companions, namely Culloden's own Jamie McCrimmon and the more refined Victoria Waterfield? "V.W. I know. Victoria Waterfield." And as he later tells his temporary ally, "She's very beautiful, Kemel." He will of course get chance to see his vision of heaven in the flesh. Like many a damsel in distress, probably, she wonders what possessed him to risk life & limb to save her. There's gratitude for you! RAPUNZEL: Ouch! I suppose you know that hurts. JAMIE: You mean, this is your hair? RAPUNZEL: Of course. I don't object to people climbing it. I'm quite used to it, actually. But you would keep tugging so. JAMIE: Oh, I'm terribly sorry. RAPUNZEL: Are you a Prince? RAPUNZEL: You're supposed to be. I'm a princess, but I suppose you knew that. My name is Rapunzel. You're not a woodcutter's son, by any chance? JAMIE: No, I'm the son of a piper. RAPUNZEL: Oh, how very disappointing. Well, in that case I think you'd better go. Goodbye. The bond between he and Ms Waterfield is given several chances to develop further before the bombshell of Fury From The Deep and her departure from the TARDIS in search of a more normal life than her friends can provide whizzing about the universe in a police box. JAMIE: Oh, Victoria. Do you think you'll be happy here ? VICTORIA: Oh, I think so. The Harrises are very nice people. JAMIE: Yes, I know that, but they're not from your time, are they? VICTORIA: I wouldn't be at ease back in Victorian times. I had no parents or family left there anyway. JAMIE: Aye, that's true. Oh, well. VICTORIA: You wouldn't go without saying goodbye, would you? JAMIE: Of course not. That won't be till the morning anyway. Goodnight, Victoria. His first line there of course echoes a similar exchange between his lady friend and their rumpled chaperone relatively early into their travels together in Tomb Of The Cybermen. DOCTOR: Are you happy with us, Victoria? DOCTOR: Yes, I know, I know. DOCTOR: You miss him very much, don't you? DOCTOR: No, of course you won't. But, you know, the memory of him won't always be a sad one. Could she ever forget the Scot who saved her from the clutches of the Daleks? Maybe she had the odd moment of remembering Jamie similarly wistfully long after he & the Doctor had departed, too. A note of longing is there at the beginning of The Wheel In Space, the wound of her departure still red raw. DOCTOR: We're not leaving her, Jamie. It was her decision to stay. She'll be perfectly all right with the Harrises. Now don't worry so much. JAMIE: I'm not, I'm just. Och, come on, let's go. DOCTOR: Well, where would you like to go? JAMIE: I couldn't care less. DOCTOR: I was fond of her too, you know, Jamie. Its perhaps also telling that it's she he remembers, sort of, long after that mind-wipe as applied in The War Games, when he's returned to his rightful place alongside his Beatle-cut buddy as a concession by the Time Lords following the little chap with the recorder's success as a Celestial Intervention Agent, as detailed in World Game from the Players trilogy. Leading directly into a meeting of two Doctors from the McCartneyish one's perspective, as he's tasked with looking into what Dastari's been getting up to. DOCTOR: Of course we will. Perhaps one of the great tragedies of their time was that he never did see it, or her, again. We as viewers wouldn't even be allowed to entertain the idea of companions in love, whether requited or not, until the era of a man very much like his aforementioned predecessor & that trip to Venice. "Venice! Venezia! La Serenissima! Impossible city. Preposterous city! Founded by refugees running from Attila the Hun. It was just a collection of little wooden huts in the marsh, but became one of the most powerful cities in the world. Constantly being invaded, constantly flooding... constantly... Just beautiful! Oh, you gotta love Venice. And so many people did. Byron, Napoleon, Casanova. Oooh, that reminds me.1580. That's all right. Casanova doesn't get born for 145 years. Don't want to run into him. I owe him a chicken."